Another HOT toy for the Christmas season is this Hatchimals Nursery Playset! Right now you can scoop this set up for ONLY $24.99 (Retail $29.99)! Hatchimal CollEGGtibles have a magical new place to play! Enter the Hatchery Nursery – an enchanted forest where you can hatch and care for your CollEGGtibles! 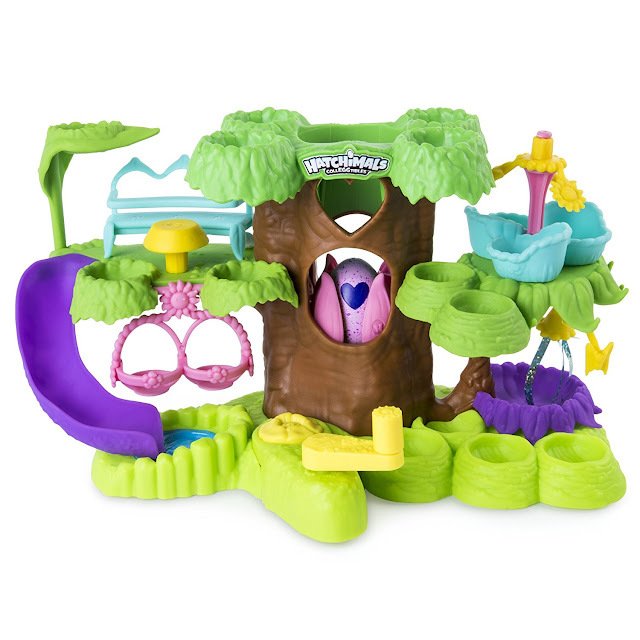 In the middle of this whimsical playset, you'll find the Hatching Tree! Use it to help hatch the exclusive CollEGGtible included in this playset. Place the speckled egg inside a secret flower, hidden deep inside the Hatching Tree trunk. Spin the yellow handle and you'll see the flower carry the egg up, up, up! Once it arrives at the top of tree, the purple petals will open and your cracked egg will emerge! Finish hatching by pressing down on the shell. Now you have a new CollEGGtible! With 35 places to play and display, there's room for your entire collEGGtion! Koalabee, Kittycan and Penguala can swing off the tree hooks, grab a snack at the feeding station, take a nap in the spinning mobile, or hang out under the streamer shower! Send your extra-playful Hatchimals down the slide, or give them a push on the swings. Romp through the magical Hatchery Nursery with all your favourite CollEGGTibles! While you're there, check out this deal on the Hatchimals - CollEGGtibles 4-Pack + Bonus for ONLY $9.39!